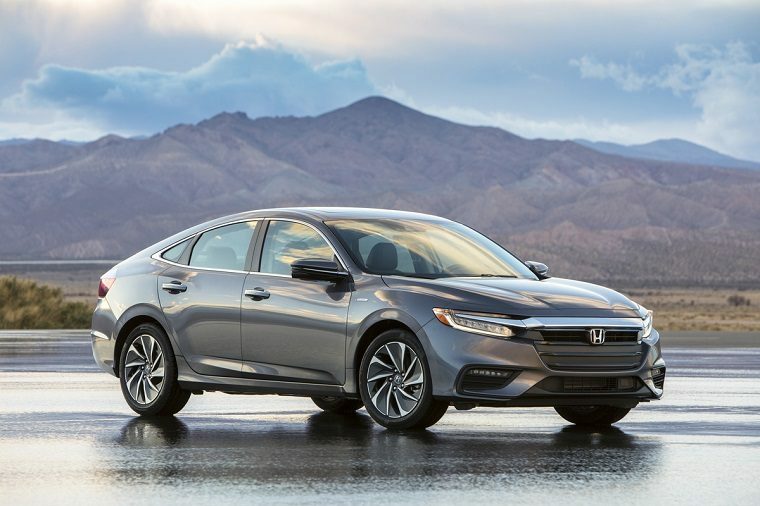 The all-new, production version of the 2019 Honda Insight is making its official world debut tomorrow at the 2018 New York International Auto Show, where it will join the Clarity series and the 2018 Accord Hybrid as the fifth electrified vehicle in the Honda lineup. The Honda Insight is a premium, hybrid compact sedan positioned between the Civic and the Accord both in terms of size and price. Its goal is to provide the comfort and convenience package of a compact sedan while delivering the fuel economy of leading hybrid hatchback models. To do this, it uses a 1.5-liter Atkinson-cycle four-cylinder, a lithium-ion battery pack, and an electric propulsion motor that produces a net system 151 horsepower and 197 lb-ft of torque. Like the Toyota Prius, it operates as a series hybrid, with electricity being sent either to the wheels or the battery pack as the system sees fit. Paddles on the steering wheel allow the driver to switch between three levels of regenerative braking strength, which helps further enhance fuel economy. Honda estimates the 2019 Insight will be able to get 55 mpg in the city, an impressive feat for a car of its size. For comparison, the Insight’s 15.1 cubic feet of space in the trunk is 3 cubic feet more than the Civic, whose chassis the hybrid shares, and the Insight also boasts an extra 1.5 inches of legroom for rear passengers. It will be offered at three trim levels—LX, EX, and Touring—with standard features including LED headlights, taillights, and daytime running lights, push-button start, a 7-inch TFT digital driver’s meter, Pandora and Bluetooth compatibility, and heated side mirrors. The EX will add SiriusXM radio, an 8-inch touchscreen display, an eight-speaker system (up from six speakers on the base LX), and Smart Entry. The Touring trim will tread into entry-level luxury territory with 4G LTE with Wi-Fi hotspot, dual-zone climate control, Honda HD Digital Traffic, perforated leather seating, a 10-speaker premium audio system, and more. The all-new 2019 Honda Insight will be assembled at the company’s plant in Greensburg, Indiana. The engine will be built at in Anna, Ohio, while the hybrid battery unit will be assembled at its plant in Marysville, Ohio. It will go on sale later this year.